You never get a second chance to make a good first impression so the Reynolds softball team made good use of its opportunity Monday. The Raiders, playing a non-league contest against Lakeridge at Lakeridge High School, scored once in the top of the first inning and rode that early run — along with a stellar pitching performance from senior Hailey Burmeister — to a 1-0 win over the Pacers. "I just wanted to get our team started," said Reynolds senior center fielder Megan Convery, who singled and scored her team's lone run in the first inning. 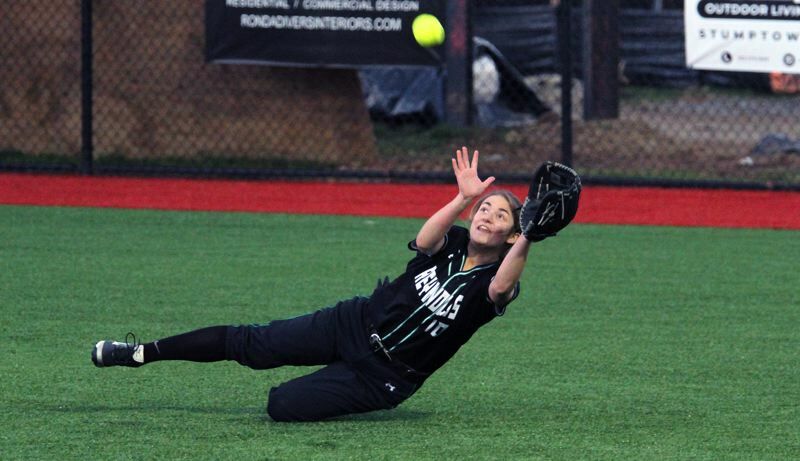 "(Lakeridge freshman pitcher Holly Beeman was) faster than the past couple of teams we've played, but we did good at adjusting," said Reynolds junior second baseman Vanessa Smoke, who drove in Convery with the game's lone run. With the win — the Raiders' third straight — Reynolds improved to 3-0 in non-league play, while the Pacers fell to 1-2 overall. For Lakeridge, which played the first game on its new turf field, the Pacers were proud of how they performed and excited about their new home field. "It's great. We're really excited about (the new field)," said Lakeridge sophomore center fielder Rachel Opferman, who collected her team's lone hit and also made a running, sliding catch in the third inning. For Beeman — she held Reynolds to one run on four hits and three walks while striking out eight — the key for Lakeridge is just continuing to improve at the plate. "I just think it's learning how to hit with each other, because that's another key thing in the game," she said. "Learning how to get people on base and move them over and really come out and play the game. We've got to string them together and build off it." The Raiders got things going right away on Monday, with Convery leading off the game with an infield single and second batter Daphne Scott laying down a bunt. Beeman fielded the ball and threw to teammate Mackenzie Nelson at first, but Convery turned past second and raced toward third, narrowly beating Nelson's throw to Emily Paulson. "I honestly didn't know if I was going to be safe at third but I'm really glad I was," Convery said. Smoke then stepped to the plate and drove Convery home with an infield groundout for a 1-0 Reynolds lead. While the Pacers didn't score on Monday — Burmeister shut them down on one hit, two walks and one hit batter while striking out nine — they certainly had their chances. The first of those came in their half of the opening frame when Rachel Mindt walked with one out and took second on Nelson's bunt before Burmeister struck out Beeman to end the threat. In the bottom of the second, Lakeridge got a leadoff walk from Anika Bjornson and a one-out sacrifice by Macie Lappin, but again, Burmeister came through to strike out Paulson and strand Bjornson. Beeman and Burmeister held sway in the third and fourth innings before the Raiders threatened again in the fifth. There, Kayley King drew a two-out walk and Burmeister reached base on a Lakeridge throwing error that advanced King to third. But then, after Burmeister stole second, Beeman struck out Convery to end the inning. In Lakeridge's half of the fifth, Opferman led off with a bunt single, took second base on Lappin's sacrifice and third when Paulson grounded out. But as was the case all game, Burmeister made sure the threat ended there, striking out Lexi Smith to keep the Raider lead at 1-0. "Haley did so well," Convery said. "We are so proud of her." Reynolds had additional chances to score in the sixth and seventh innings, but came up empty each time. In the sixth, Smoke and Maya Phillips both singled and Adia Messenger followed with a two-out walk to load the bases before Beeman struck out Olivia Hutchins. In the seventh, Burmeister walked with one out and Convery followed with an infield single before Beeman strung together two straight strikeouts to end the inning. Lakeridge's last chance began when Beeman was hit by a pitch to open the bottom of the seventh, but she got no farther — Burmeister set down the next three batters in order to seal the win. "I think as the season goes on, we'll be able to get those opportunities to score more and be able to hit in timely situations more," Convery said. "That's something we're still working on." "We've been working really hard and we have a lot of spirit on our team," Smoke said. For their part, the youthful Pacers — they have just one senior and two juniors — believe they have what it takes to make a good season. "As a team, our defense is really strong and I think that our hitting is really good," Opferman said. "We just need to be able to adjust off different pitchers." Convery went 2 for 3 at the plate for Reynolds, while Smoke was 1 for 4 and Phillips 1 for 3. Opferman went 1 for 3 for the Pacers. Next up, Reynolds hosts Sherwood at 4:30 p.m. Wednesday and faces Franklin at Erv Lind Stadium at 4 p.m. Thursday. Lakeridge plays at Grant at 4 p.m. Wednesday and hosts West Albany at 6:30 p.m. Thursday.